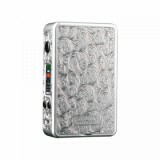 The Hotcig R150S MOD is an updated version of Hotcig R150 which comes with more exquisite embossed panel and brand-new waterproof HM chip. 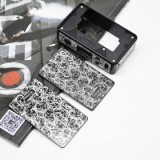 BuyBest has Black and Silver color on sale now. The Hotcig R150S MOD is an updated version of Hotcig R150 which comes with more exquisite embossed panel and brand-new waterproof HM chip. Hotcig R150s Box Mod, which can support adjustable resistance, is powered by dual 18650 batteries to fire up to 150W to deliver huge cloud. In addition, magnetic battery cover ensures convenient changing of batteries and high quality zinc alloy material offers up-scale texture. What are you waiting for? Just get it to enjoy perfect vaping. 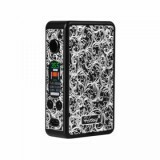 • BuyBest also has the Hotcig R150 Box Mod on sale. 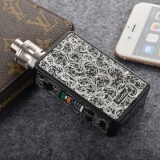 I got this mod at a great price. Best price I could find anywhere. The box comes in it's own bubble wrap. This was my first hotcig product and it is a great mod. The panels are high quality and make the mod look way more expensive than it is. I'm hesitant to take the mod out because I don't want to break the panels. GB should stock the replacement panels. I'm sure there is a huge crowd who bought this mod here. From my initial use, I found it to be similar to my other mods. Unfortunately only 22mm atties will fit without overhang. Overall great mod, I'm glad I added it to my collection. I order the black colour but I received silver!!! Box really good and functional.